A marvellous amount of extensions have been made for the MSX system. 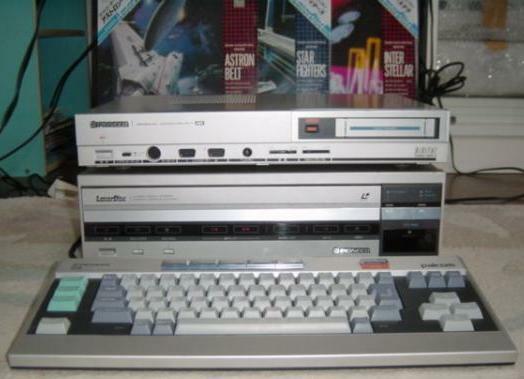 One of the most ambitious extensions was the Laserdisc game system. Arcade machines were very expensive and normally costed more to play than normal video games. Home computers with LD players were very expensive. Pioneer made perhaps the best effort with the MSX standard in Japan. Almost all of the released games were for the NTSC video standard and this prevented penetration into the European market. There were plans to make also PAL games for MSX, but they were cancelled due to poor sales. Only few PAL versions exist for arcade systems. Players did not have a feeling of free control with most LD games. The Pioneer Palcom PX-V7, with the LD-700 Video Disc Player underneath it and some games in the background. Note that the Sony 900-series does have superimpose and laserdisc control via RS-232, but the built-in basic for controlling the LD player is not compatible with the Pioneer P-Basic. Also, getting the sound of the game track to the cassette-interface needs some work in the form of hardware modifications. The most difficult problem with the Sony 900 series — and other European MSX computers — is however the PAL-NTSC incompatibility. So far, no one has tried to play games with the Sony 900-series. And it is not recommended to try it! There are no descriptions of how to do it, only some thoughts how it might be done, so there may be a lot of undiscovered hardware and software problems ahead. The game background — and in most cases also the player’s character — is stored as video on the disc. Also, the disc has two sound tracks: on MSX discs one was used for the game data and the other for sounds. For other systems both tracks were used for audio. MSX is the only known system which used another track for saving data in audio form. All other systems used different media for loading the game program: either it was loaded from floppy disk or in older systems data was stored into ROMs. The way to load the game on MSX is quite similar to loading a game from tape. The CALL LD command should be typed in basic and then the computer initialises the player and seeks the starting signal on the audio track. After receiving the signal, the game will be loaded. It would be possible to use arcade discs with MSX as well, but then you need to code the game program yourself. One may wonder how it is possible to make a game from some played video images, because the player may get ‘Game Over’ in the middle of a scene. Due to the way of how data is saved on the disc and the random access possible with the players, Laserdisc has some advantages over the other formats. As far as I know every normal LD player has simple functions to access the disc. For example: search for an individual frame on the disc, play backward and forward with variable speeds, jump to chapters programmed onto the disc, show the time, search for a time, mute a selected audio channel, scan the disc frame by frame, etc. And most of these functions can be controlled from the remote controller. Now, when a game player loses his life for example, the game program notifies this and gives a search command to the Laserdisc player to retrieve the correct frame. The frame is searched and played. The game player sees then a nice ‘Game Over’ animation on the screen. Searching is very fast, maybe 1 second or less. The most important thing is the video standard the computer uses, because good quality and correct NTSC-PAL transformation is far from easy or cheap. So, the easiest solution for getting a compatible system is to get a Japanese computer. There are European (PX-7) models from Pioneer that use the PAL standard, but they are incompatible with MSX Laserdisc games, because all games produced for MSX are made in NTSC format. A normal MSX (NTSC, Japanese) can perform the same functions as a PX-V7 using a special device attached to the cartridge slot: the Pioneer ER-101 MSX Expansion Processor. It includes the needed circuitry for controlling the player as well as superimposing the picture and also the P-Basic. This expansion is very rare and it does not work even with all Japanese MSX models. It also does not work on MSX machines with disk drive and non-MSX1 models. The reason for this incompatibility is probably the location of P-Basic in the slot. See also the user’s guide. The ER-101 is almost an MSX computer on itself! It sort of makes your MSX a Pioneer PX-7. It includes ‘Laser Vision Player Control’, ‘Superimpose’ and ‘P-basic (extended MSX-basic)’, just like is built in in the PX-7. For Pioneer you need either an LD-700 (US) or LD-7000 (Japanese) player, or LD-500 (Japanese) or LV-1000. There seem to be a lot of other Pioneer laserdisc players which have I/O-ports similar to the LD-7000, but their compatibility with the PX computers is not tested. The easiest solution is getting an LD-700 or LD-7000, which are tested to work in several systems. Fortunately these two types were popular players both in the United States and Japan for playing movies, so they are still available time by time for example at US eBay and Yahoo Japan. As said above, the Sony 900 series can also control a laserdisc player. You cannot play games with it, but you can use it for combining Laserdisc images with superimposed images from the computer. You can use any Sony player (maybe also from other manufacturers) which has an RS-232 interface with 900-series. Known suitable models are LDP-1450, LDP-1550, LDP-2000 and LDP-3600. There was once a player specifically for the HB-G900P: the LDP-180P with IF-180 interface. This player and interface seem to be extremely rare nowadays. They are mentioned in the manuals of the G900. A total of 11 games were published for MSX and today they are all rather hard to get. The complete list of games is below. They were never sold in Europe, only in Japan. If you want to find any, then it is better to look for them in Japan, but they are not common there either. The normal price for these games is 5,000-12,000 Yen each, but the rarest titles may go as high as 30,000 Yen. The price depends on the condition as well. Note that the background graphics in all LD games are very good, but the sprites are MSX(1) quality. Also there were 12 educational software discs published, containing English, Japanese and Mathematic lessons for junior high school students. LCT001 Mystery Disc 1: Murder, Anyone? The parts for laserdisc systems are not cheap. The computer may cost 60-100 Euro, a player might be 30-60 Euro and game discs about 60-100 Euro each, apart from Konami and some other rarer titles. And these prices are not including shipping costs. For the player alone, shipping costs are easily 100 Euro or more; discs are 20-40 Euro and a computer is 50-70 Euro. But if you are still interested in getting a system, good luck! Some games and computers have been offered lately in eBay by Japanese sellers as well. For players you can try eBay.com; there are cheap players sometimes. And if you buy any player, remember to ask the seller to lock the shipping screw on the unit. At least the LD-700 has it. It is important, because the player may be severely damaged internally if it is not done properly. If you want keep your money safe, do not buy laserdisc stuff. But if you want to get some really special MSX items, go ahead. Be careful though with parts and ensure that they work and are well packed when you buy them. Benefits of a working system are twofold: a nice rare MSX computer and a laserdisc player which plays nice movies also. The picture and sound quality in discs is still very good, if discs are not too much damaged. Good luck if you decide to buy them!